These primates don't monkey around. In fact, they're not monkeys at all. Bounce across the bridge and into the gazebo to see siamangs. Head over to Africa to see chimpanzees. Gorilla. Photo courtesy of Kathy Dominguez. Gorillas, orangutans, chimpanzees and siamangs are apes, not monkeys. Apes have long arms, no tails and heavier bodies than their monkey relatives. Most apes are omnivores, eating fruit, vegetables and meat on occasion. Apes are curious, playful and intelligent. Zookeepers use enrichment to keep the apes active and engaged. Boxes, balls and other toys filled with fruit and treats encourage natural behaviors like foraging and puzzle solving. The 2014 Ebola outbreak was the most deadly outbreak for humans in the history of the virus. But humans weren't the only species affected. 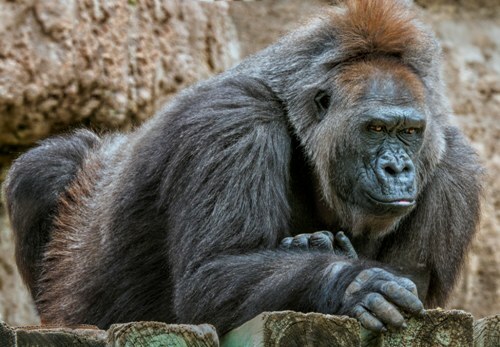 In the past 30 years an estimated 1/3 of the world’s gorilla and chimpanzees have died from contracting Ebola. The Association of Zoos & Aquariums help support wild ape populations through Species Survival Plans (SSPs). Adopt an ape. Become a Zoo Parent. The NM BioPark Society has set up an Amazon wish list for the ABQ BioPark Zoo's primates. Browse the list and buy enrichment and training items for the primates.